EARLY BIRD PRICES - PREBOOK ONLINE AND SAVE $5 A TICKET! Contemporary Latin Jazz merges with Afro-Cuban Salsa for a unique concert on Friday 23 October at the beautiful Yeppoon Town Hall. Lovers of the distinctive sounds and rhythms in World Music, Latin Jazz and Salsa Dance can groove to Brisbane's powerhouse Salsa group Chukale, and inventive jazz trio Cleon's Three. Composer and pianist Cleon colours his Capricorn Coast birthplace with splashes of Cuba by touring these two leading groups of Australian Latin music, who will be supported by local fusion jazz group Indaba. After a successful tour of Australian jazz clubs earlier this year, Cleon Barraclough on keys and Sasha K on drums, join with electric bassist PW Farrell, to perform songs off their debut album Techni-colour Rain. Their guest artist on tour is Uruguayan born conga and percussion master Gustavo Cereijo. Leader of Australia’s premier Afro-cuban ensemble Chukale, Gus enriches the project through his lifelong devotion to Latin American music. Cleon's Three will transport their audience on a musical journey with spirited, original works inspired by Cuban culture. Completing the Extravaganza will be Chukale, a benchmark outfit for Latin American music in Australia. Their credits include supporting 8-time Grammy award-winner Chucho Valdez, Grammy award-winning Los Van Van (Cuba), Afro-Cuban All Stars (Cuba), La 33 (Colombia), Sonora Carruseles (Colombia) and Grammy award-winning Los Amigos Invisibles (Venezuela). 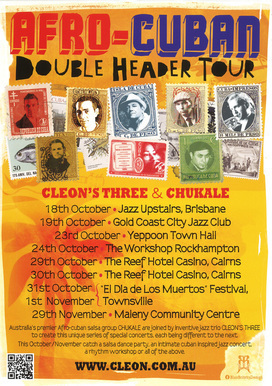 Chukale will fire up the Yeppoon Town Hall dance floor with 2 energetic sets of Afro-cuban hits and classics. The 2015 Afro-Cuban Extravaganza Concert will sweep you away with a concoction of world sounds, improvisation, experimental jazz and heart thumping dance floor grooves.